My parents go to a lot of places since my mother has retired from her job. From family functions to vacations that they take, they bring back a lot of memories in form of photos and videos. These are all backed up on my home PC desktop which has 500 GB of memory. Recently when I went home, the OS won't load which after some troubleshooting I figured out was due to hard disk corruption. I replaced the hard disk with a 1 TB hard disk but how to get back the photos from the hard drive! My mother was quite upset that she didn't keep a backup of the photos in form of printed photos, yes, that how my parents go old-school when new technology causes a problem to them. I couldn't connect my hard disk to my PC but there was still my personal Hard Drive which I had used for temporary data backup when we bought this new PC and therefore could be used to salvage something. So, my search led me to Stellar Phoenix Windows Data Recovery Pro. The great thing was that when I tried it out I could see the files which will be recovered before I actually pay the price for the software. Before we go ahead, I would suggest everyone reading this article to not let yourself fall into such a state and rather store your photos and other important data using any of the cloud storage solutions that you feel is good or at least buy one external hard disk to have a second copy of your data. 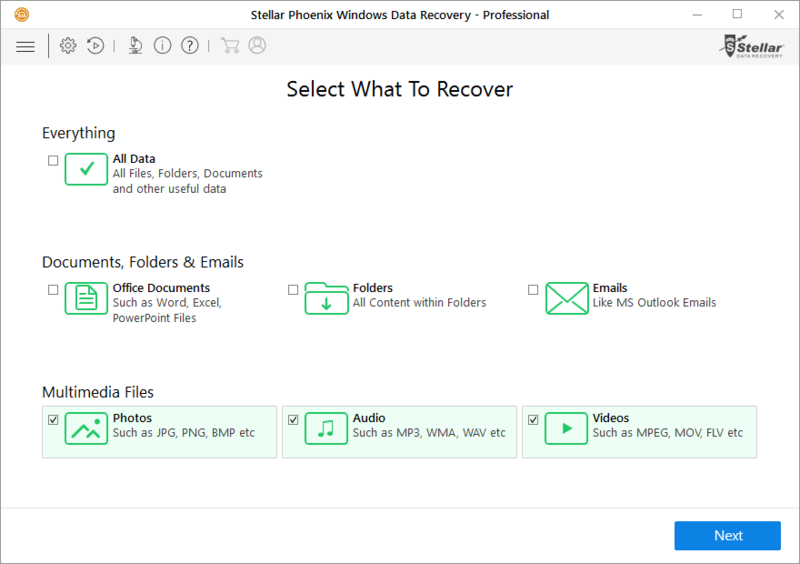 Now let's see what all features Stellar Phoenix Windows Data Recovery Pro has that makes it one of the suggested data recovery solutions on Techulator. 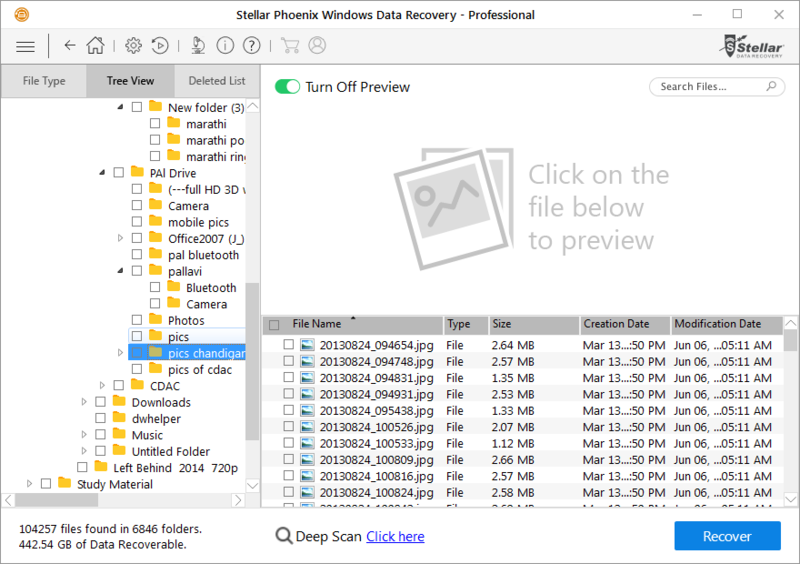 "For beginners and non-technical users, Stellar Phoenix Windows Data Recovery is the obvious first choice among data recovery software. A beautifully designed, efficient interface makes the program a pleasure to use." The home screen of the application has a simplistic UI where you can select the type of file you want to recover or you can just select All Data. In the menu bar there are icons for Advanced Settings, Resume Recovery, About, Help and Professional Data Recovery Services which gives you the contact details of Stellar Phoenix Data Recovery services including their WhatsApp number. On the second screen, you can choose where you want to run the recovery software on. It can be your commonly used locations like the Desktop, My Documents, a whole partition or an externally connected media like in our case my WD Hard drive. My WD hard drive is of 1 TB size and it was a good test for Stellar Pheonix Windows Data Recovery software to show how fast it can read through all my hard drive to find out deleted files. Do note that I have never yet formatted this disk so it should give up a lot of recoverable data. Once you hit Scan button, a 2 phase process starts. Phase 1 took around 3 minutes 30 seconds to complete, quite impressive when you consider the size of hard disk it is scanning. The second phase, though it showed more than 30 minutes as the estimated time of recovery, the actual process just took around 10 minutes to find almost 442 GB of recoverable files. The files recovered are all the files ever stored on this hard drive. I don't use much of the space of 1 TB available on my hard drive due to which the data ever stored on this hard drive was never overwritten. All the image as you can see have been recovered as well as a lot of other multimedia files as specified in the Home screen. In case you can't find the file in the normal scan, you also have the option to run a Deep scan on the storage media. This type of scan takes a lot of time. I tried such a scan with an 8 GB USB drive and the expected time to recover any data on this was around 5 hours. Don't run this scan as your default scan but only when the normal scan is not able to throw up your expected file. The recoverable files are too many to sort through and recover in one sitting. In this case, you can just save your Scan results so that even after restarting your computer you don't have to start the scan again and you can continue recovering the files to your file system. In my case, all the files that I recovered were of the original quality with no damage whatsoever. 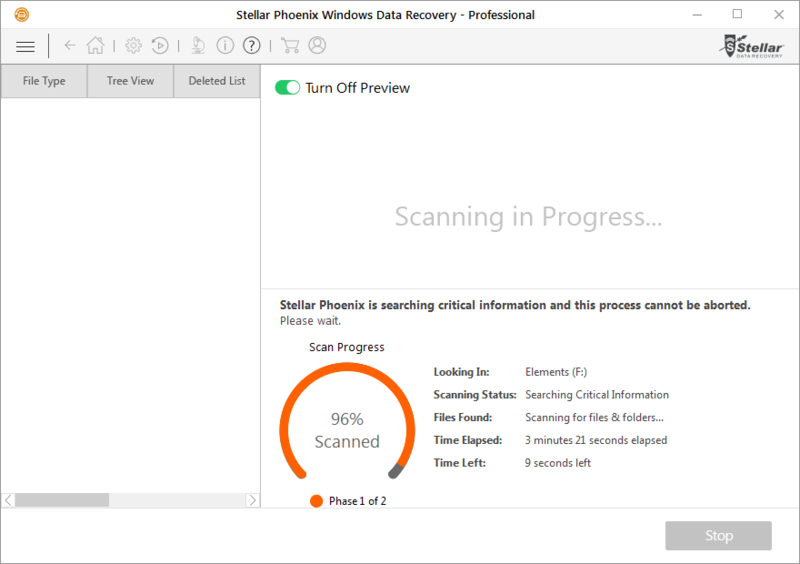 Though Stellar Phoenix Windows Data Recovery is capable of repairing damaged files too, it will have its own limitations and you might not able to get a 100% satisfactory recovery all times, especially if the storage is being frequently used for data writing and modification and the file you are trying to recover was deleted long back. The menu bar contains an Advanced Settings option which can be highly useful for you if you are going to use this software frequently. In this section you can turn off the preview of the recoverable files which will speed up your scan process, in the second tab you can specify in detail which files you can to recover so that the software can directly skip the files types not selected by you, therefore, increasing the scan speed as well as recovery. Here you can also resume a recovery process stopped and saved in between, export your license files and check for version updates. 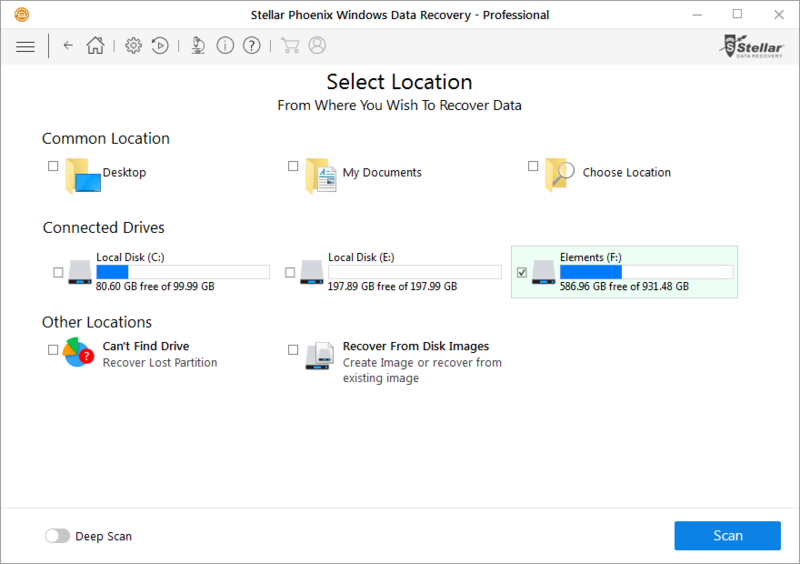 Stellar Phoenix Windows Data Recovery Pro provides the feature of creating an image of your whole partition or drive. This will speed up your recovery process whenever a data loss occurs. For advanced users, you can even specify the sectors of the partition you want to backup. If you are missing the whole partition from your computer, you can recover that too using this software. In the second screen, you will find a "Can't Find Drive" option that you can use to search your entire computer hard disk to look for partitions that are not appearing now. 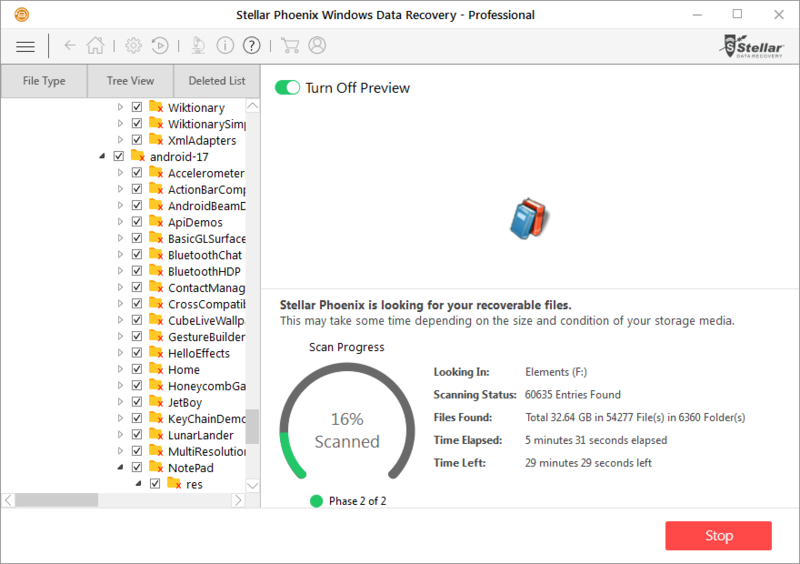 With the Professional version of the software costing Rs.6,499 at the time of writing this review, Stellar Phoenix Window Data Recovery Pro is definitely not the cheapest data recovery software out there but it definitely holds a number of features that make your data recovery task much simpler and faster. It delivers what it promises and more through the additional features of Partition Recovery and Image creation. The files that come out are of good quality and protects you from any future mishappening too in case of a storage media corruption.